The Guangzhou part of the tour was amazing but the local Macau tour operator was horrible. From a practical point of view, the tour was extremely well organized and managed. All services were provided as planned and on time. 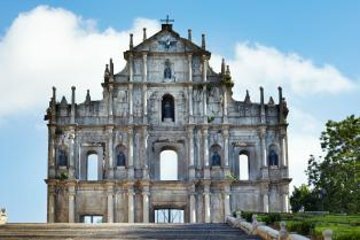 Our main reservation relates to the guides, particularly the one that gave us the guided tour of Macau. She spent the majority of the time cracking unrelated jokes and trying to sell us various tourist trinkets instead of providing information about the sites. The dinner cruise in Guangzhou was also disappointing in that the food was very basic Chinese fare and all the commentaries were in Chinese. Top notch hotels and guide service! It saved all the hassle of arranging transportation, lodging and finding things to do in HK, Macau and Ghuangzhou. Overall enjoyed it very much! Thank you Viator! The guides were all excellent. So much more can be achieved in one day with a driver and guide. The accommodation was extremely good perhaps a bit too classy. We have two concerns. The font on the ferry voucher is so small that we were given tickets to HK not Kowloon. Fortunately, we had contact details for Stephen Hou and were able to phone him and be collected at the ferry terminal. The itinerary for our full day in Macau was misleading. We were to visit the Macau Museum and the Macau TV tower with the admission price included. We did not go the Museum and when we went to the tower we had to pay the guide HK$130 each for admission.